End of July 2008: ‘Shakespeare Must Die’ screenplay is finished. (Red Shirt Movement did not yet exist, as far as the writer-director Ing K is aware). 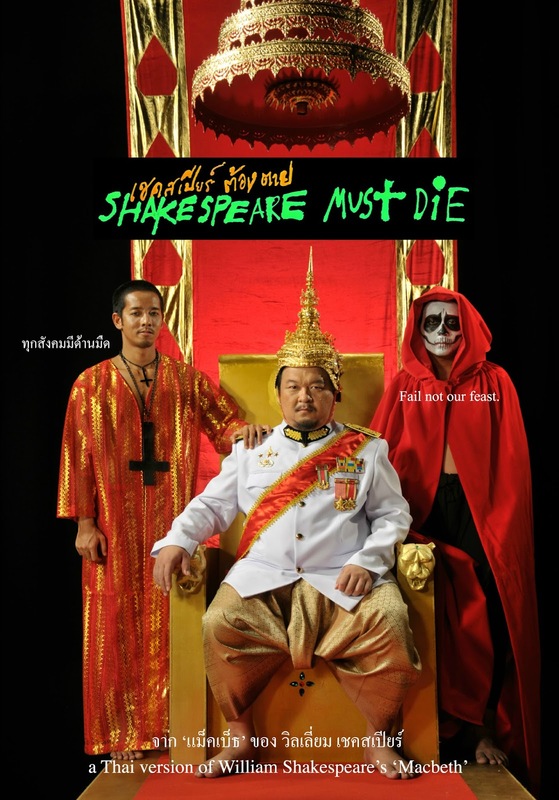 23 August 2010: ‘Shakespeare Must Die’ is the last project to receive financial support (3 million baht) from the Creative Thailand Film Fund, dispensed by the Office of Contemporary Art, a department of the Ministry of Culture. The funding decision has been delayed by concerns that the regicide scene in this Thai version of ‘Macbeth’ may offend the monarchy. The filmmakers had to shoot the scene and show all footage of it to the Ministry’s film funding committee, which concluded after viewing that far from being offensive to the monarchy, the film should be supported for its indepth exploration of true morality. In normal practice, the censors issue a rating decision immediately after viewing a film, but in the case of ‘Shakespeare Must Die’, the decision is delayed for one week, after a second screening for the whole committee. After the censors watch the film for the second time, producer Manit Sriwanichpoom is summoned to answer their questions and concerns, especially over the prominent use of red, the colour worn by government supporters, which “could cast the red shirts in a negative light”. Manit is told to return on 2 April, when the decision will be made after a third viewing. Producer Manit and director Ing K arrive for their appointment with the censors at 10 AM, but they are told to wait. At noon, they are told to come back in the afternoon. By late afternoon, there is no decision and they are told to return the next day. In the morning the cast and crew of ‘Shakespeare Must Die’, led by the producer and the director stage a costumed execution of Shakespeare by Macbeth in front of Government House and hand in their appeal against the ban to a representative of Prime Minister Yingluck Shinawatra, in her capacity of chairman of the National Board of Film and Video. In the afternoon the producer and the director file their appeal with the National Board of Film and Video office at the Ministry of Culture, 666 Baromrajachonnee road. The minister of culture tells journalists that the decision on the appeal will be announced on 25 April. The producer is summoned to testify before the cultural ministry’s legal affairs subcommittee. At the end of a 2-hour session, committee members appeared optimistic that the ban will be lifted. Producer Manit is asked whether he would accept the high 20 rating (no one under 20 may see the film); he says yes. The appeal verdict, which the cultural minister had told the press would be issued today, is postponed to 11 May. 3 May 2012: The National Board of Film and Video watches the film at a specially booked screening room at Kantana Lab. At 2 PM, producer Manit receives a telephone call from the office of deputy Prime Minister General Yuthasak Sasiprapa, summoning him and the director to a meeting at his office at Government House tomorrow. The filmmakers arrive at Government House at 9 AM as summoned, and were shown into a formal meeting room along with two officials from the Office of Contemporary Art (Ministry of Culture), which funded the film. At 10 AM, they are told that General Yuthasak has not arrived; his aide, General Jongsakdi Panichkul will conduct the meeting on his behalf, a “friendly, casual chat” in his personal office down the corridor. Also present are two army officers, his aides, a general and a colonel, who have all seen the film and say they like it. General Jongsakdi did all the questioning. He says that General Yuthasak, who has been appointed by PM Yingluck to preside over the Film Board in this case on her behalf, doesn’t understand why the censors banned the film and allowed the matter to escalate all the way to Government House. He (Yuthasak) has seen ‘Macbeth’ in a theatre in London as well as ‘Shakespeare Must Die’, and believes that “if you watch it with a heart unbiased with injustice, there is nothing to worry about. If you’re looking for trouble, then every scene in it is a problem.” In conclusion, General Jongsakdi tells the filmmakers to relax, as “this will end well, with a compromise. To save the censors’ face, you’ll probably get the 20 rating. Can you accept that?” The filmmakers say yes. 2 PM, the National Film Board’s final meeting on ‘Shakespeare Must Die’ (deputy PM General Yuthasak presiding for PM Yingluck) at the ministry of culture. Other issues were first discussed, but when they get to the appeal decision on the banned film, all cultural ministry officials including the head of the censorship office (civil servant, not censorship committee member) are told to leave the conference room. They wait outside along with the filmmakers and journalists. General Yuthasak leaves early and tries to avoid the army of journalists which trap him by the lift. He appears visibly shaken and uncomfortable and refuses to speak other than to say “They will tell you what you want to know,” before rushing away. After another long wait, officials who had been sent out of the conference room are told to go back in. When the door finally opens, everyone including the minister of culture Sukumal Khunpleum and permanent secretary Somchai Sianglai rush out without a word, despite being hounded by the press, leaving behind only the deputy permanent secretary Apinan Poshyanand. He is visibly upset. He tells both the journalists and the filmmakers at the same time that he believes that “the film has great artistic merit… I am very uncomfortable with this decision, namely to let the censors’ banning decision stand….I believe there are real problems with the film law, which should be amended.” The appeal is denied. 28 May 2012: President of the Film Directors’ Association of Thailand, Tanyawarin Sukhapisit, calls a meeting to discuss a campaign to eliminate the banning clause from film legislation. (Her own film, ‘Insects in the Backyard’ was also banned, for obscenity; she has filed cases against the censors and the Film Board at both the Administrative and Constitution Courts.) A prominent director bemoans the indignity and powerlessness of Thai film directors because of the banning clause and the close relationship between the Federation of Thai Film Producers and the censors. Producer Manit and director Ing K file a petition with the Citizens’ Rights, Political Rights and Media Rights section of the National Human Rights Commission. The petition is received by NHRC general secretary Weerawit Weeraworawit and Dr Niran Pitakvajara, chairman of the section. Producer Manit and director Ing K file a petition with the Senate House Committee on Human Rights and Freedom and Consumer Protection. Despite the high drama and heightened security as parliament is surrounded by thousands of anti-Thaksin protesters (protesting the Reconciliation Bill being discussed in parliament), committee chairman senator Somchai Sawaengkarn finds time to accept the petition. First hearing at the National Human Rights Commission. The ministry of culture side is represented by deputy permanent secretary Apinan Poshyanond. Second hearing at the NHRC. The cultural ministry side is represented by permanent secretary Somchai Sianglai and the ministry’s legal team. 28 June 2012: The Film Directors’ Association of Thailand and Kasem Bundit University Film School hold a private screening of ‘Shakespeare Must Die’, followed by a seminar to discuss film law amendment. Prominent director Banjong Kosalawat (‘Nual Chawee’) says that he has been trying to change the law for 30 years without success. Other panelists include association president Tanyawarin Sukhapisit, ‘Ong Baak’ director Prachya Pinkaew, ‘Laddaland’ director, Kong Rithdee and Panu Aree (‘The Convert’), Chalida Uabamrungkit of the National Film Archive, NHRC commissioner and former senator Jon Ungpakorn, a team of i-law human rights lawyer, Manit Sriwanichpoom and Ing K. The ‘other side’ is represented only by one member of the Film Board, who leaves early before the Q & A from the audience. Dr Niran Pitakvajara, chairman of NHRC subcommittee on Citizens’ Rights, Political Rights and Media Rights, informs producer Manit by telephone that the NHRC has found clear evidence of power abuse as well as infringement of constitutional rights in the banning of ‘Shakespeare Must Die’. The paper findings will released within two months. Inquiry session by the Senate House Committee on Human Rights and Freedom and Consumer Protection. The ministry of culture side is represented by Samart Chansoon of the Film Censorship Board, one of the censors who refused to sign the banning order. The session is recorded. The picture that appears to emerge is that the banning of ‘Shakespeare Must Die’ was motivated by the political climate, and the film law itself is open to abuse and needs to be amended. Producer Manit (First Claimant) and director Ing K (Second Claimant) file a legal complaint with the Administrative Court (tries state power abuse cases) against the Film Censorship Board, the National Board of Film and Video and the Ministry of Culture. The legal team from the Lawyers’ Council, which has taken on the case pro bono, is led by former NHRC commissioner Vasan Panich, who has worked on cases of extra-judicial killings in the War on Drugs, the Southern violence and the October 6 massacre. 1. The 2008 Royal Edict on Film and Video has provisions that may contradict or be in conflict with Article 29 of the 2007 Constitution of the Thai kingdom, which distinctly states that “The restriction of constitutionally-guaranteed rights and freedom of individuals cannot be done, except when empowered by legislation.” Articles 26(1)-(6) and Article 29 of the Royal Edict on Film and Video empowers the Film Board to issue orders based on personal discretion. The Subcommittee has recommended that the Royal Edict on Film and Video should be amended so that it is in line with the intent of the Constitution. 23 November 2012: The Administrative Court accepts the Shakespeare Must Die vs the Censors case, Black Numbered Case # 1321/2555, for consideration. Government has ratified on 29 October 1996. It states: “everyone shall have the right to freedom of expression; this right shall include freedom to seek, receive and impart information and ideas of all kinds, regardless of frontiers, either orally, in writing or in print, in the form of art, or through any other media of his choice. “Furthermore, we would like to refer your Excellency’s Government to article 15 of International Covenant on Economic, Social and Cultural Rights which has been ratified by your Excellency’s Government on 5 September 1999, and which “recognize the right of everyone to take part in cultural life”. As stressed by the Committee on Economic, Social and Cultural Rights, the right to take part in cultural life entails rights of participation in, access to, and contribution to cultural life, and encompasses the right of everyone “to seek and develop cultural knowledge and expressions and to share them with others, as well as to act creatively and take part in creative activity” (E/C.12/GC/21, paragraph 15-a). Under article 15, States Parties have also undertaken “to respect the freedom indispensable for scientific research and creative activity”. United States Department of State’s Annual Human RightsCountry Report on Thailand (Page 25) cites the banning of ‘Shakepeare Must Die’ as an example of the government’s restrictions on Academic Freedom and Cultural Events. ‘Shakespeare Must Die’ filmmakers submit their response to the film censors’ testimony. 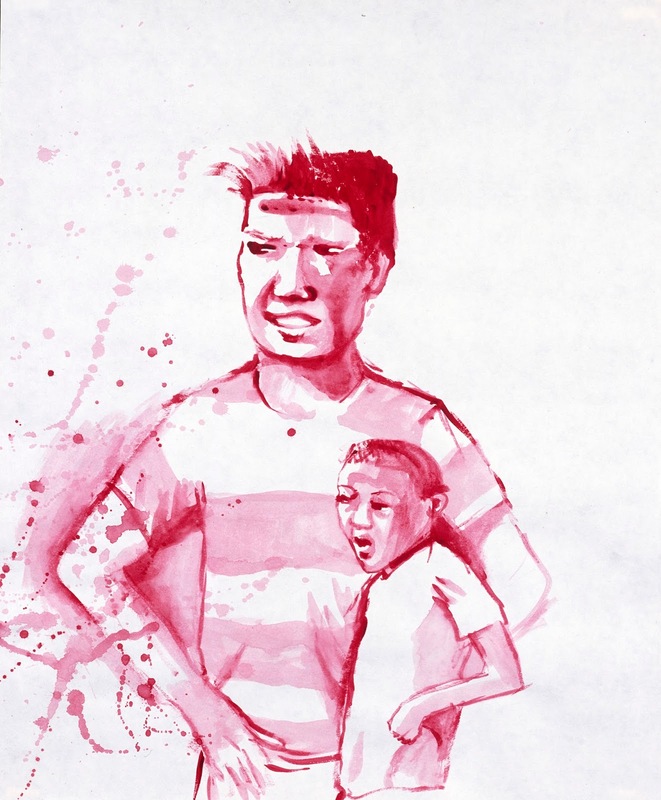 “1/ Most significantly, we were subjected to discrimination. The Board of Censors claims that we are “too violent, must be cut”, but in reality, films far more violent than ours pass breezily through and shown everywhere. This is one circumstantial evidence that clearly indicates that “The October 6 Scene” is not the real issue but merely a convenient go-to objection. - Normally the Board rules immediately after one screening. But in the case of ‘Shakespeare Must Die’ the Board insisted on watching it 3 times. Board members displayed symptoms of fear (not of us but of “politics”). At first their objections sounded so nonsensical, it was as if they were out for trouble, eg. the use of the Thai alphabet in the film, even though it is a Thai film made for a Thai audience; the lead actress’ necklace (which they claimed was alluding to “the Saudi Diamond”, even though the gem in question is a blue-green semi-precious stone. They especially stressed the use of the colour red, exactly the same time as [big movie studio] Sahamongkol Film’s movie ‘Anthaparn’[ ‘Gangster’] received permission to hang big red banners printed with “Red is Returning—to Bully” everywhere, and even though in Thai folk opera Likay tradition, the executioner always wears a red headscarf. We are inspired by Likay tradition. - The censors’ questions, and the tortured twists and turns of the process, which no other film had ever had to endure, prompted producer Manit to suspect that something was amiss. The citing of “The October 6 Scene” as the final condition is likely to have been merely an excuse, since many other films inspired directly or indirectly by October 14 and October 6 have passed the censors before (e.g. ‘Horror University’, ‘Fah Sai Jai Chuen Barn’ [‘Clear Sky and Glad Heart’] and ‘October Sonata’). Producer Manit asked: if I cut this, do you guarantee to pass the film? The censors replied that there are no guarantees; they have not asked for a cut but for a “suitable correction”, which they said was “less severe than a cut”, which is vague and tortuous, further convincing us that this is not a true and sincere condition, and whatever we did they would not pass the film. It was only that the censors could not find a more plausible-sounding reason (and which would not affect the government’s democratic credentials). This testimony by the censors to the Film Board is a slanderous distortion of the truth, since we have never insisted thus (a recording exists to prove it). We said we were inspired by a news photograph of October 6. Please observe how the camera’s main focus is on the expressions and responses of the crowd cheering on the violence rather than on the perpetrator of the violence and the corpse. It’s clear from this that our aim is to arouse awareness in the audience, so that they wouldn’t rise up and kill each other or cheer on or threaten violence as has happened in the past (and the present), a time when the people are being exhorted and incited to hate and kill each other. 4/ The trailer with the aforementioned scene in it received a pass from the censors. This is another evidence that clearly indicates that the censors’ reservations were not over this scene. They are merely using this scene as a reason to ban the film, by exploiting the controversial aura of the words ‘October 6’. 5/ The undeniable proof that the film censors’ deliberation process is dictated by political pressure or “the Order Chit” from above is the case of the documentary film ‘Fah Tum Pandin Soong [‘The Sky is Low, the Land is High’; official English title ‘Boundary’]. This film was recently banned but within 24 hours apologies were offered directly to the director that “it was all a misunderstanding”. The film was passed (after muting 2 seconds of sound about the King) and received a rating of 18, not even 20+. This overturning of the banning order did not have to pass through the appeals process, even though the Permanent Secretary of the Ministry of Culture was one of the censors who had ordered it banned. And in the banning order for ‘Fah Tum Pandin Soong’, the board members listed their reasons in detail, unlike in the case of ‘Shakespeare Must Die’, which says only that the content causes disunity among the people of the nation. “1/ The discriminatory use of the law and the ministerial regulations (if I understand it correctly). This contradicts the facts, because since the enactment of the Royal Edict on Film and Video 2008 in October 2009, the National Culture Commission of the Ministry of Culture published the ‘Guidebook to Film Censorship’, which establishes the ministerial regulations defining the rating system, which was distributed to filmmakers and other stake-holders and interested parties including parents, young people and the general public to explain the rules of the new rating system. But the defendant did not use the enacted ministerial regulations in their deliberation. Meanwhile the defendants had already applied these regulations with all other previous films, by bestowing ratings on many films such as ‘The Legend of Naresuan’ and many more. It can be said that the defendants unfairly discriminated against the plaintiffs. Accordingly this film is about karmic retribution, the thirst for power by a ruler without ethics. It has nothing whatsoever to do with the events of October 6, 1976. It is only that the makers of the film, in the filming of the scene of Dear Leader’s followers attacking the play’s director, were inspired by the tragic news photograph of October 6, 1976 by Mr Neal Ulevich, Associated Press photographer, in the way in which violence is conveyed. In the scheme of things, as regards to the level of violence, this scene is barely violent when compared to action and horror movies that are all permitted to be widely shown, or even the film ‘The Legend of King Naresuan’ which was rated under ‘Films that inspire learning and should be promoted to be widely seen’. In ‘Shakespeare Must Die’ it can be seen that neither the director, the camera nor the editing is focusing on the perpetrator of violence and the hanging corpse. The focus is on the faces and reactions, on expressions of satisfaction and blood-thirst among the mob cheering and laughing over the violence before their eyes (identical to the attitudes of the mob in the AP news photo). It’s clear from this that the film intends to arouse the viewer’s conscience and bring awareness and wisdom, to remind us that this terrible thing once happened when the people allowed themselves to become intoxicated by malignant propaganda designed to incite people to kill each other. It is the hope of both plaintiffs that viewers of this film would feel nauseated by what happened then and agree with us that there is no reason for us to kill each other. “The Board’s deliberation deems that the film ‘Shakespeare Tong Tai’ (Shakepeare Must Die) has content that causes the fracturing of unity among the people of the nation, according to Ministerial Regulation describing types of motion picture, B.E. 2552, item 7(3). Then when the 2 plaintiffs submitted an appeal to the National Board of Film and Video (defendant #1), the Board set up a Lagal Subcommitee to Consider the Appeal to probe the facts. Plaintiff #1 had the opportunity to explain the facts to this Subcommitee in person. The Subcomittee had no reservations over “The October 6 Scene”. They further said: “We should be able to find good solution.” One woman Board member asked Plaintiff #1: “If you don’t get the rating of Recommended that you asked for, but receive a higher rating, would you find that acceptable?” Plaintiff #1 said “Anything would be fine that the committee sees fit to pass, even if it’s 20+”. Both plaintiffs wish to confirm that they never told defendant #2 that this film is presenting the truth of October 6, 1976 events (see page 12 of the transcript of the audio recording of the Q & A session between defendant #2 and the 2 plaintiffs). 3/ October 6, 1976 is not listed in Ministerial Regulations 2009 as a topic forbidden to filmmakers. If mention of the events of October 6, 1976 causes disunity among the people of the nation, it wouldn’t have been permitted in school textbooks and all these websites. 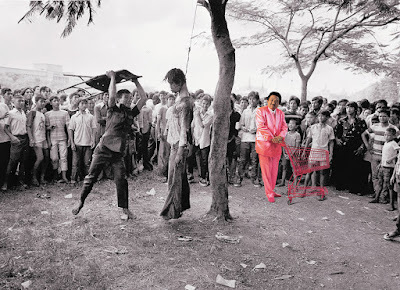 It should be noted that this is not the first time that plaintiff # 1 and #2 have used images of October 6, 1976 in their art work to reflect Thai socio-political problems. In the photographic series ‘Horror in Pink’, plaintiff #1 Manit Sriwanichpoom used news photos from the events of October 14, 1973; October 6, 1976 and May 1992 as part of the creation of his art work, by inserting a man in a pink suit pushing a matching pink supermarket cart into news photographs from the 3 events, to remind Thai society of our heroes who sacrificed their lives for the freedom that those alive today enjoy. 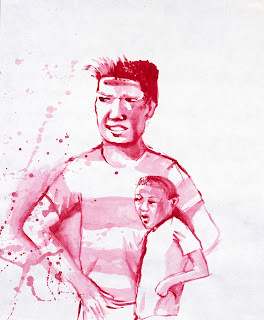 This work was exhibited in ‘History and Memory’  at the Chulalongkorn University Art Centre, August 15 – September 1, 2001; Chiangmai University Art Centre in 2002, and as part of the exhibition ‘October 14 through Artists’ Eyes’ at Chulalongkorn University’s Jamjuri Gallery, organized by the Office of Contemporary Art and Culture of the Ministry of Culture, October 9 – 18, 2003. 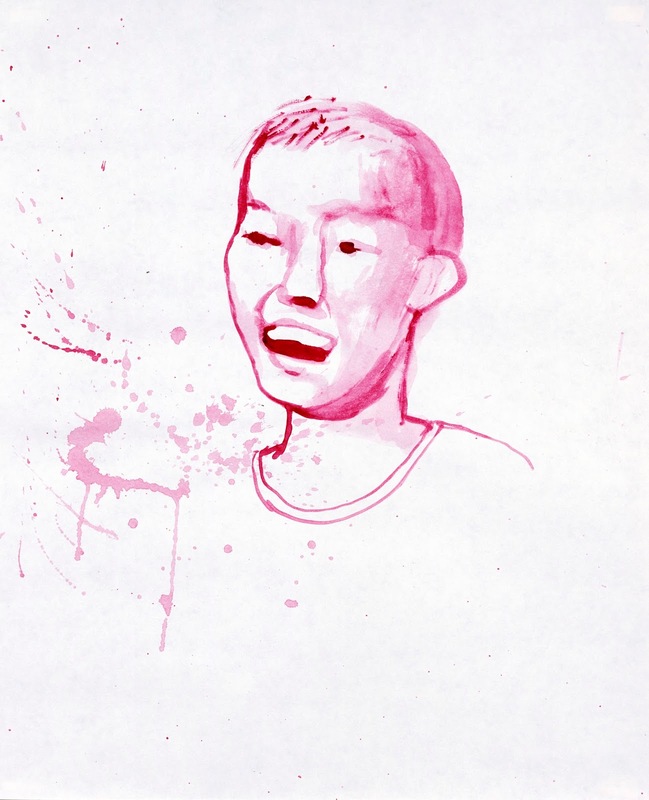 Description: ‘Horror in Pink #1’ (produced 2001), conceptualized by Manit Sriwanichpoom. Original photograph from the events of October 6, 1976 by Neal Ulevich, Associated Press. 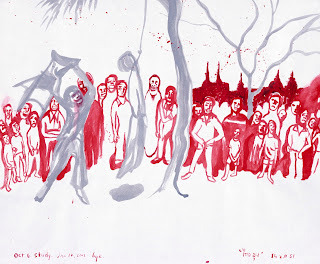 In the series of work entitled ‘Where Are They Now?’ (2008), plaintiff # 2 Miss Smanrat Kanjanavanit [Ing K] created watercolour paintings to raise a question over past violence as seen in Neal Ulevich’s news photograph of October 6, 1976: Why did all these spectators cheer on the savage brutality of the man who was using a folding chair to bash the corpse of a student protester for democracy which was hanging from a tamarind tree? 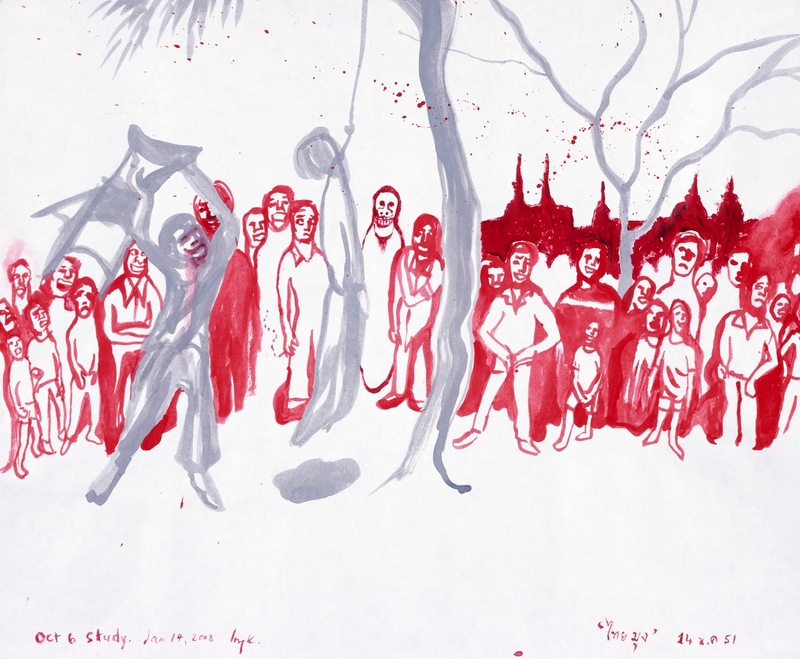 The series ‘Where Are They Now?’ was part of a group exhibition ‘Flashback’76: History and Memory of the October 6 Massacre’ at the Pridi Institute, August 2 – 23, 2008. These art works with content directly related to October 6, 1976 were publically exhibited and widely distributed in the form of booklet catalogue and in the media to the general public and never met with any protest or any other obstacle whatsoever. Therefor, defendant# 1 and #2’s claims have no weight; they are merely groundless implausible speculation without any comparable precedence or criteria on which to base their deliberation. 4/ On the issue of violence, the ministerial regulations have clearly laid out guidelines on the rating system, which defendant # 1 and #2 could have followed but did not follow. Defendant #2 never declared to the 2 plaintiffs that the film would be denied permission it was not amended, nor did they explicitly state in word written or spoken which scene, which dialogue at which point of the film that may be deemed to “cause disunity among the people of the nation”. They merely asked that the film be withdrawn from the censorship process and “corrected”. Even the scene that defendant #2 alleges that the 2 plaintiffs claimed is “presenting the true events of October 6, 1976,” defendant #2 did not give the plaintiffs the ultimatum that unless this scene was cut, they would not pass the film. Defendant #2nwas also unable to explain why the scene inspired by October 6, 1976 could not be allowed to be made into film; there is no such stipulation in the ministerial regulations. Such lack of clarity in instruction made it impossible for the 2 plaintiffs to obey. Now that we have the Royal Edict on Film and Video 2008 whose raison d’etre is to promote the Thai film industry by instituting a rating system as universally applied throughout the world, both plaintiffs sincerely believed that their film would receive permission, even if the worst-case scenario rating for violence of ‘Not for Under 20 Years of Age’. This is why the plaintiffs insist on making no corrections. The 2 plaintiffs had in fact upon submission of their film asked for the rating of ‘Films that Inspire Learning and Should Be Recommended’, since ‘Shakespeare Must Die’ is concerned with the moral concept of sin and conscience, which furthermore had received funding from the Make Thailand Strong [Creative Thailand] Fund under the Office of Contemporary Art and Culture of the Ministry of Culture. Even during the appeal process, the Sub-committee for Legal Opinion and Consideration of the Appeal which was set up by defendant #1 did not advise the plaintiffs to cut the scene that defendant #2 calls “the October 6, 1976 scene” in any way. Their conclusion at the end of the inquiry session was that there would be a good solution. As those under the jurisdiction of the Royal Edict on Film and Video 2008, when officials lack clarity, it is difficult for those under their rule to follow. It should be noted that it is a sensitive matter to make changes in a film, as all such change affects the content of the film and its artistic value; it also entails a large expenditure that should not be made without a sound and clear reason. The 2 plaintiffs see that both defendant #1 and #2 are confused about the above scene. In reality, a group of thugs with red headscarves led by an aide of a dictatorial president known as ‘Dear Leader’ breaks into a theatre performing a play that satirises Dear Leader; they then proceed to beat up the audience and drag out the play director to be hanged by the neck and hit with a folding chair. The events of this scene is showing that the fictitious country in ‘Shakespeare Must Die’ is ruled by a cruel-hearted president with followers who are thugs who go around beating up critics of Dear Leader. This has nothing to do with differences in political opinion. The ruling that the film ‘Shakespeare Must Die’ has content that causes disunity among the people of the nation is unreasonably severe, the personal opinion of both defendant #1 and #2 which cannot be proven. By nature, cinema is a medium of limited access, unlike other more accessible media like television, newspaper, radio and the internet. The audience is also relatively small and cannot conceivably become the cause of chaos or divisiveness. It should be noted that no film has ever sparked or been the cause of past events of divisiveness; not the events of October 14, 1973; October 6, 1976; Black May 1992, and the more recent April 2010 and May 2010. The producer of a film that has been banned by the Board of Film Censors may submit an appeal to overturn the ban to the National Board of Film and Video within 15 days. The appeal deliberation must result in a ruling within 30 days. In the case of ‘Shakespeare Must Die’, all due process was followed and observed. “1. The narration involving the Royal Institution is inaccurate, as in [Time Code] minute 0.29 : “Celebrations for the King’s 84th Birthday.” The linking of events in question to the Institution which is then entitled ‘The Sky is Low; the Land is High’ may cause the audience to misinterpret the meaning, because the specifics of the film do not reflect the title, so what is the filmmaker thinking and wishing to convey? The events presented are claimed to be by documentary [evidence], nut it is the [unsupported] conclusion of the filmmakers’ opinion, even though some of the events remain under judicial review and official investigation. Apart from this, there are no other documentary findings to clearly support such claims or whether any such event actually occurred. For instance [Time Code] minute 1.48 : In this area “red shirt protesters who mostly came from upcountry were closed off and massacred.” [Time Code] minute 1.58 : “Almost 100 people died.” [Time Code] minute 2.04 : “The people of Bangkok and other dissenters gleefully supported this dissolution of this protest.” [TC] minute 2.09 : “The Thai government at that time claimed it was the work of a Third Hand working to create circumstances to frame and blame the government.” [TC] minute 2.17 : “Red shirt protesters and supporters believe the government and the military are responsible.” [TC] minute 2.29 : “The people of Bangkok and many non-supporters praised the government and the military.” [TC] minute 2.44 : “People from the provinces are openly despised as stupid and money-grubbing.” [TC] minute 45.00 : “The Thai and the Cambodian governments jointly registered Khao Phra Viharn as a World Heritage Site.” Etc. The narration done by superimposed titles in the film sometimes makes observations in conflict with the image of rural landscapes. 2. The content’s meaning has the tendency to cause divisiveness among the people of the nation, causing disunity, which is forbidden by Ministerial Regulation Article 7(3). 3. The content affects national security and international relations, in presenting images of soldiers on the border in a firefight with their opposite number; images that reveal the positioning of foxholes; the mention of Cambodian soldiers moving the border marker is not backed up by any evidence that it actually occurred. These all fit the criteria as forbidden by Ministerial Regulation Article 7(4). Merely 2 days later, on 25 April 2013, the Office of the Board of Film and Video Censors of the Ministry of Culture’s Department of Cultural Promotion contacted the producers of the film ‘Fah Tum Pandin Soong’ to apologise for the error in their deliberation process; the ban on distribution in the Kingdom is only the ruling of the Sub-Committee; it is not the ruling by the Large Committee. In the case of films that are banned from distribution, normally the filmmakers must first be summoned to explain and the Large Board’s verdict must be obtained. And the Large Board has just had the opportunity to view the film, and ruled that it may be distributed to those of 18 years or older, with the request that 2 seconds of sound at the beginning should be muted, during New Year celebrations at Rajprasong Intersection [sequence] when the MC on stage says, “We’re here together for the Countdown and to celebrate the King’s 84th Birthday”. The producers of the film saw that the sound in question is merely atmospheric sound, not the main substance of the film’s content, so were willing to mute the sound. As for the other parts that the Sub-Committee had objected to as inappropriate, the Large Committee had no objections and allowed the entire content to stand. It can be seen that in the case of ‘Fah Tum Pandin Soong’, the producers did not have to proceed in any way. They did not need to explain their reasons; they did not have to file an appeal even though the banning order’s conditions are clear and easy to follow. This incident has widely caused doubt and suspicions among other filmmakers. Can it be possible that the Permanent Secretary of the Ministry of Culture who signed the banning order by her own hand would be ignorant of the rules of procedure? Would not the Secretariat of the Sub-Committee which the Permanent Secretary chaired give warning of procedural irregularity? How can the verdict be overturned in less than 2 days? This is a clear example of the discriminatory practice of the National Board of Film and Video. NHRC concludes that the Film Censorship Board and the National Film Board violated the Constitutional right to freedom of thought and expression. The NHRC recommends that the ban should be revoked and the film allowed to be released with the rating of 18+. NHRC further recommends that the 2008 Royal Edict on Film and Video be amended. The Administrative Court is to due to read the verdict at 10 AM, Court Room 10, Administrative Court (3rd floor), Chaengwattana road.